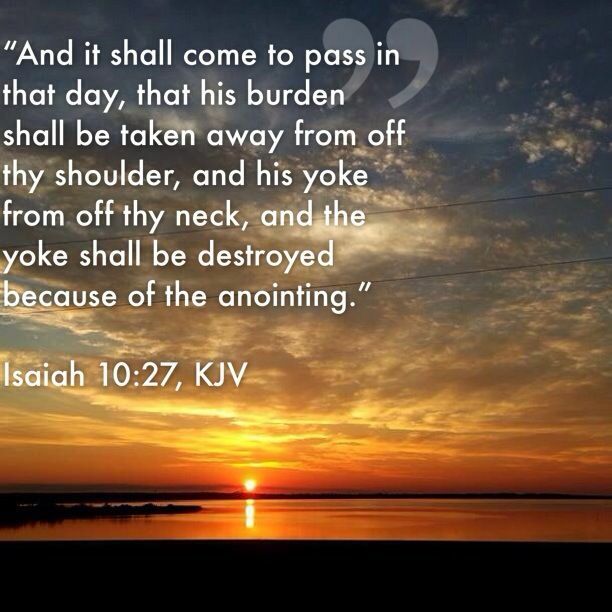 Isaiah 10 vs. 27 – And it shall come to pass in that day, that his burden shall be taken away from off thy shoulder, and his yoke from off thy neck, and the yoke shall be destroyed because of the anointing. What are the lessons from this scripture? The third lesson is that this burden has to be taken off your shoulders for you to fulfil your destiny. The fourth lesson is that this yoke on your neck, the yoke of poverty, sickness, dream attacks, nightmares, masturbation, sexual perversion, anger, greed, rebellion, stubbornness, has to be destroyed before Gods plan for your life will be fulfilled. Lesson no 7: these burden and yokes are breakable, no matter how long or stubborn they are. Lesson 9: today is the day of salvation; TODAY is THAT DAY the Bible talks about. Lesson 10: burdens and yokes, can only be broken by the ANOINTING, which is the power of God. What is a Yoke or burden? What is the anointing that breaks yokes and burdens? Acts 10 vs. 38 – How God anointed Jesus of Nazareth with the Holy Ghost and with power: who went about doing good, and healing all that were oppressed of the devil; for God was with him. Anointing is the power of God that breaks yokes. Anointing is the power of God that destroy stubborn burden. Anointing is the power of God that set the captives free. Anointing is the power of God that makes you stronger than the strong man enemy. Anointing is the power of God that disgraces Goliaths, Herods, Pharaohs, and other oppressors. Anointing is the power of God that breaks chains of oppression. Anointing is the fire of God that consumes boosting powers. Anointing is the power of God that pushes children of God into breakthrough. Anointing is the power of God that casts out devils. An anointed person is spiritually powerful. An anointed person is filled with Holy Ghost. When the Spirit of God falls on you, it makes you become a candidate of signs and wonders. Elisha requested for and received a double portion of the Spirit of Elijah (2Kings 2:9) and he was able to do twice as much miracle as his boss. Elijah did 16 miracles, Elisha 32. And some of the miracles of Elisha were as twice great. Elijah shut the Heavens for 3 and ½ years (James 5:17), Elisha for 7 years (2 Kings 8:1). Even our Lord Jesus Christ did not perform any miracle before the Holy Ghost descended on him in a bodily shape like a dove upon him (Luke 3:22), at the banks of River Jordan. It was after this divine impartation that he was led to the wilderness full of the Holy Spirit, and returned to Galilee in power of the Holy Ghost to begin his miracles marked with signs and wonders. This entry was posted in Babatope Babalobi, Prayers and tagged babalobi, Babatope Babalobi, Bible study, christian prayers, Christianity, church, deliverance prayer, deliverance prayers, God, Jesus, Prayers, Religion, Save the World, spiritual warfare.